Facebook Messenger may be playing catch-up in the great messaging app race, but the near-constant flow of enhancements should ensure that more people get roped into using the service. In a new update, Facebook added the ability to send video messages to friends and a bigger thumbs-up symbol, for when you really, really like something your friend said. We tried it, and it works. Now, you can either “Like” something or you can “Big Like” something. To get the giant blue thumb, all you have to do is press down on the like button a little longer than usual. Then, the biggest blue thumbs-up you’ve probably ever seen will pop up on the screen for you and your friend to see. A similar action is required to send a short, 15-second video message. When you hold down the picture button, the app automatically knows that you want to send your friend a short video and opens up the camera app to let you begin filming. Previously, Facebook only let you send pre-recorded videos, but with this update, you can now shoot and send impromptu videos from inside the app. Of course, sharing and shooting videos within the messaging app itself is very common. WhatsApp and several others have been offering the exact same service for a long time already. 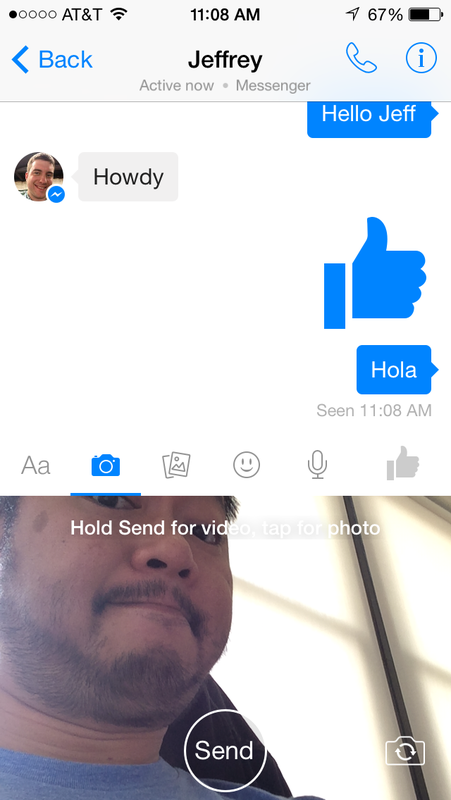 Facebook Messenger’s capabilities were rather lacking up until recently, when Facebook started to add new features. Now that the social network has pushed Messenger out of its main app and added all the bells and whistles we expect from a quality messaging app, it looks like the app’s fortunes could rise. The new update is available for download now on iOS and Android.